Japan Mines Seabed “Fire Ice” – The World’s Most Dangerous Source of Energy? Japan Oil, Gas and Metals National Corporation, a Japanese state-owned prospecting company says it has successfully extracted methane gas from an undersea methane hydrate deposit in the Nankai trench south of Japan’s main island of Honshu. This marks the first successful extraction of methane from such deep sea deposits. The team expects their pilot rig could extract up to 10,000 cubic meters of methane gas per day. Deep sea methane hydrates could supply Japan’s energy needs for 100 years. For a resource-poor country still recovering from the aftermath of the March 2011 tsunami and Fukushima nuclear disaster, this sounds almost too good to be true. But methane hydrate mining carries unique risks which could make this one of the most dangerous sources of energy. Methane hydrates are also called methane clathrates. They consist of molecules of methane (CH4) trapped in a crystalline cage of water (H2O) molecules. The substance somewhat resembles water ice but it forms only under the extremely high pressures and cold temperatures of the deep ocean floor and, unlike water ice, methane hydrate ice is flammable and prone to explosive sublimation. Extracting methane (the primary component in natural gas) from methane hydrates is difficult because such deposits only occur in very deep water. The Japanese drilling ship Chikyu, also called Godzilla-maru for its enormous size and 100 meter tall drilling derrek, performed its methane extraction about 50 miles offshore from Japan’s Atsumi peninsula 300 meters (1000 feet) beneath the Pacific’s surface. Mining methane hydrates is risky because these are unstable solids. It is possible that BP’s 2010 deepwater horizon blow out which dumped millions of barrels of oil into the Gulf of Mexico was triggered by the explosive sublimation of a methane hydrate deposit. It is also possible that mining methane hydrates near the edge of continental slopes may cause landslides and trigger tsunamis. A third risk of methane hydrates is their global warming potential. Any methane escaping from such deposits is 21 times more powerful than CO2 as a greenhouse gas. Burning the methane trapped in undersea deposits would release twice as much carbon dioxide as all of the world’s coal, oil, oil-shale and gas deposits. Given Japan’s energy shortage it is understandable that its government might want to explore risky options such as undersea methane hydrate deposits, but we need to carefully weigh the risks against the benefits. 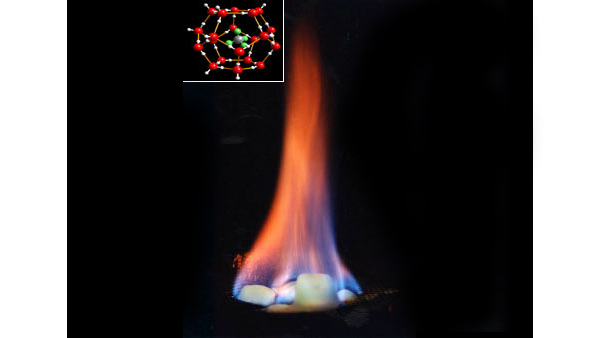 Public domain image of burning methane hydrate ice provided by the US Geological Survey.